Apple just unveiled the newest member of its iPhone lineup of smartphones. Dubbed the iPhone 4S, the latest offering by the Cupertino-based company is more of an incremental upgrade than a complete overhaul of the iPhone 4. Design and dimensions stay the same, but there's a notable increase in processing power. The Apple iPhone 4S comes with the A5 chipset, which is the SoC that powered the iPad 2. It comes with a dual-core Cortex-A9 CPU and PowerVR SGX543MP2 GPU, which as we know is a pretty powerful combo. The Apple iPhone 4S also improves on the network data speeds of its predecessor. It's not the LTE everyone was hoping for, but 14.4 Mbps is still pretty good for most market. More importantly, however, the iPhone 4S is a true world phone, supporting both GSM and CDMA networks. The other major upgrade that the Apple iPhone 4S brings is in the camera department. The 5 megapixel shooter of its predecessor has been replaced by an 8 megapixel unit and the video recording has been upgraded from 720p to 1080p. 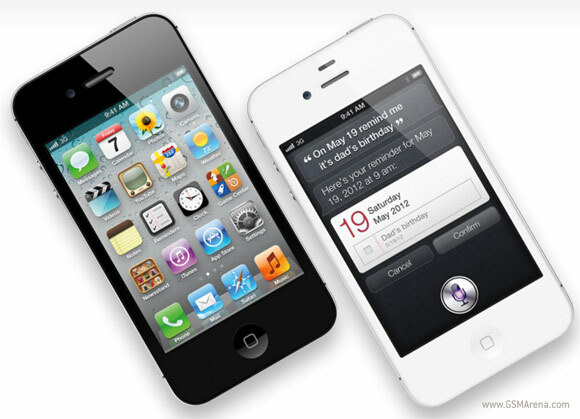 Much like its predecessor, the iPhone 4S will come in black and white color versions (only this time the white one will be available from day one). However there will be three storage options this time - a larger 64GB edition will join the 16GB and 32GB ones. The iPhone 4S pre-orders will start on October 7, while actual sales begin on October 14. Pricing on a two-year contract is $199,$299 and $399 for the 16GB, 32GB and 64GB versions, respectively. In the US the Apple iPhone 4S will be available with AT&T, Verizon and Sprint (for the first time). Canada, Australia, UK, France, Germany, and Japan will be the other countries in the first wave to get the new iPhone, while 63 other countries will join before the end of the year.